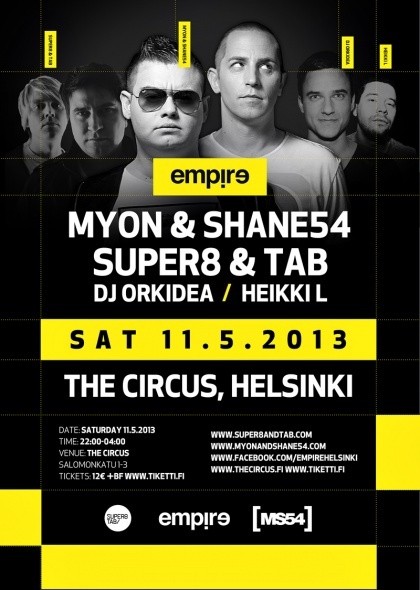 Hailing from Hungary, Myon & Shane 54 have achieved extraordinary success in the international dance music scene, having established a solid reputation for themselves with notable releases including numerous Beatport number ones and consistent rankings among DJ Mag's Top 100 DJs. They produce for some of the biggest names in music, are constant fixtures in set lists of some of world’s best known DJs, and regularly feature in a multitude of EDM radio show playlists. Limited edition VIP tickets available only for 200 clubbers! VIP table for for group of 6 persons. VIP table for for group of 8 persons. Only 1 available for group of 8 persons. VOITA VIP pöytä, 4 VIP lippua sekä pullo kuohuvaa! Jaa kuva (public) ja tykkää Empire sivusta niin olet mukana arvonnassa!